Secluded beaches and bustling shopping malls, energetic nightlife and ample opportunities to just switch off and recharge your batteries; a Phuket escape can be whatever you want it to be. At the 4-star MANATHAI Surin Phuket, a stylish, romantic, and oh-so-luxurious resort only a stone's throw from the Andaman Sea, the only thing missing from this Thai paradise is you - and a friend. Need a longer escape? Choose the 11 day / 9 night package. The perfect place to relax and unwind, each Deluxe Pool View Room features a private balcony with views of the swimming pool, plus an ensuite bathroom with complimentary amenities. Unwind in style at Manathai Surin Phuket, a secluded hideaway just steps from one of Phuket's most beautiful beaches. Aromatic lotus ponds are a defining feature of this elegant, 66-room boutique resort. Inside, colourful handicrafts and rich silks contrast against smooth, dark timber to create a warm and inviting atmosphere. The resort features two swimming pools, an indulgent day spa, pool bar, and fabulous onsite dining venue - Pad Thai Restaurant. 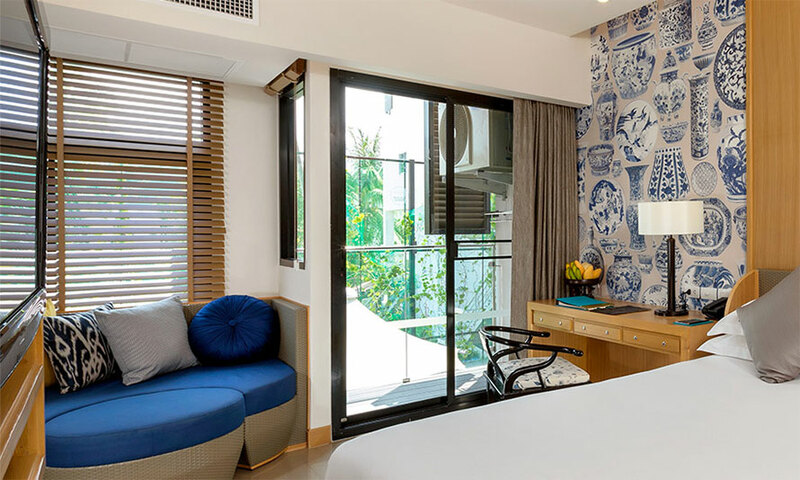 Located on the west coast of Phuket Island, Manathai Surin Phuket is a short 40 minute drive from Phuket International Airport and within easy access to an array of dining, shopping and entertainment venues. Calm and serene by day, Surin transforms into one of Phuket’s coolest night spots with trendy beach clubs featuring performances by famous DJs. The famous resort town of Patong is located just 30 minutes south. Today, depart from either Sydney, Melbourne, *Brisbane, *Adelaide or *Perth for Phuket, Thailand! Fly with award-winning Singapore Airlines, Thai Airways, Cathay Pacific, Emirates or Qantas Airways to name a few (subject to availability). Upon arrival, be met by a hotel representative for your transfer to the resort - your home for the next seven magical nights. Once you have checked in to your resort room, the relaxation or exploration can begin. Today you will be met and transferred by your resort representative to Phuket International Airport for your connecting flight back home. Today you will be met and transferred by your hotel representative to Phuket International Airport for your connecting flight back home. Travel offer is valid for travel on selected dates until the 18th of December 2019. *Flight High Season surcharge: $300 per person. **Flight Peak Season surcharge: $550 per person. 7 Night package: $150 per person. 9 Night package: $200 per person. 7 Night package: $200 per person. 9 Night package: $250 per perosn. Sydney, Melbourne, *Brisbane, *Adelaide, *Perth. Best available rate at time of check-in will be charged for additional night’s stay, Payable direct to resort at time of check-in. 2 Adults (subject to availability). - 1 x Infant (0 – 4) can stay free of charge at the property, sharing existing bedding with parents and do not count towards the maximum room capacity.. Please note; additional flight charges may be applicable. - Cots/cribs are free of charge (subject to availability). - Children 12 and over are classed as adults. - Complimentary lunch or dinner is valid one time per stay for the 7 night package and two times per stay for the 9 night package. - All bookings are non-refundable and cannot be redeemed for cash. We recommend you take out a comprehensive travel insurance policy immediately after making your booking to cover you against cancellation. We will not be liable for any costs or losses incurred in the event that you cancel your booking. - Any changes to your booking, including but not limited to departure date, tour length, passenger name/s, and flight ticketing requests, are subject to availability and may will incur charges. Please refer to the Schedule of Fees at the end of this document for further details. - All cancellations must be provided in writing/email by the person who holds the booking, this cancellation needs to be confirmed by an employee at TripADeal. A tourist visa is not required for Thailand if travelling on an Australian Passport.